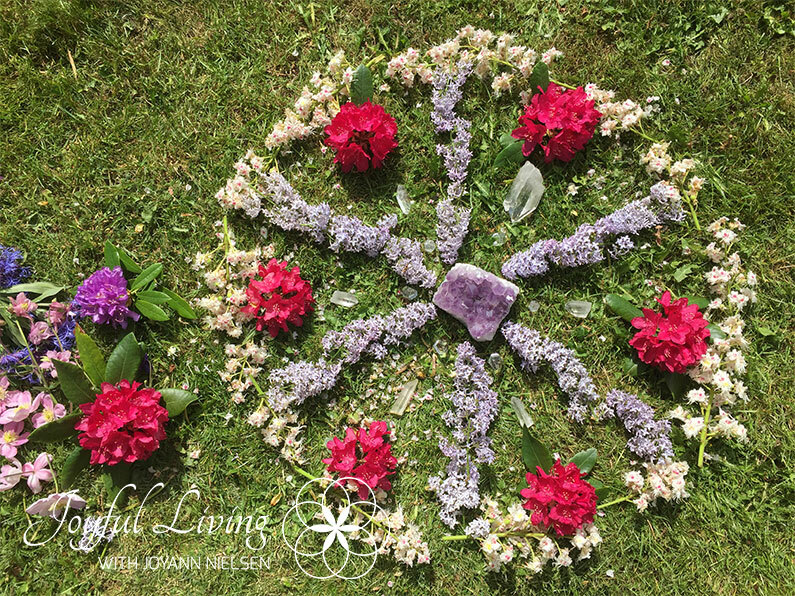 Today, I feel a creative inspiration to create an Abundance Flower Mandala in my garden. It is mid-May. 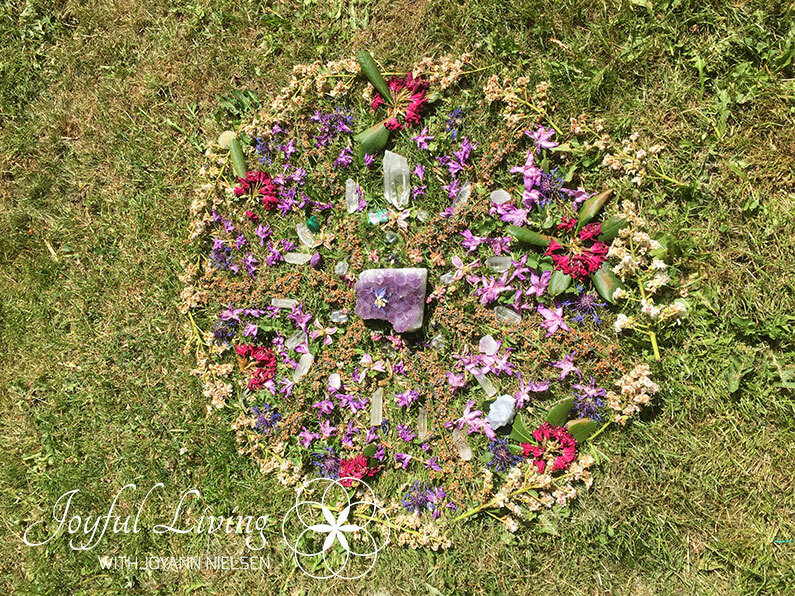 It´s a perfect Flower Mandala day. It has been hot, very hot indeed, for several weeks. Summer has come really early in Denmark this year. My garden has many flowers in May and June, and this year it’s as if all the flowering trees and shrubs have been really busy. I see and smell an abundance of beautiful, beautiful flowers of all colors, all over the garden. Nature’s gifts always come where it is … .. natural. Therefore, we just have to follow and enjoy what is here – right now and here. I give thanks to the power of nature, to Mother Earth, to the Elves and Devas of my garden, to all that binds it all together. My inspiration today is to create an Abundance Mandala – a holy circle. On the danish version of this post I have a video you can watch, to join the process. ( I speak danish in the video, but you might enjoy watching anyway). The first step was to receive the idea. The feeling. I wanted to create something beautiful, and chose to make a Flower Mandala. So, I followed my inspiration. Instead of judging it as “not relevant” or “waste of time” or “I´ll do it later”. (Ego talk). I found a basket that was perfect for collecting the flowers. I actually bought this lovely basket a few weeks ago because I wanted a flower collecting basket. I think it’s a plus that the flower container is beautiful – but you can of course use any container. I wanted both flowers and crystals in my Mandala. I took my basket and went for a tour in the house, picking up the crystals and gemstones that called me, and placed them at the bottom of the basket. (I have quite a collection crystals in my home). Then I went for a garden tour with my rose scissors. 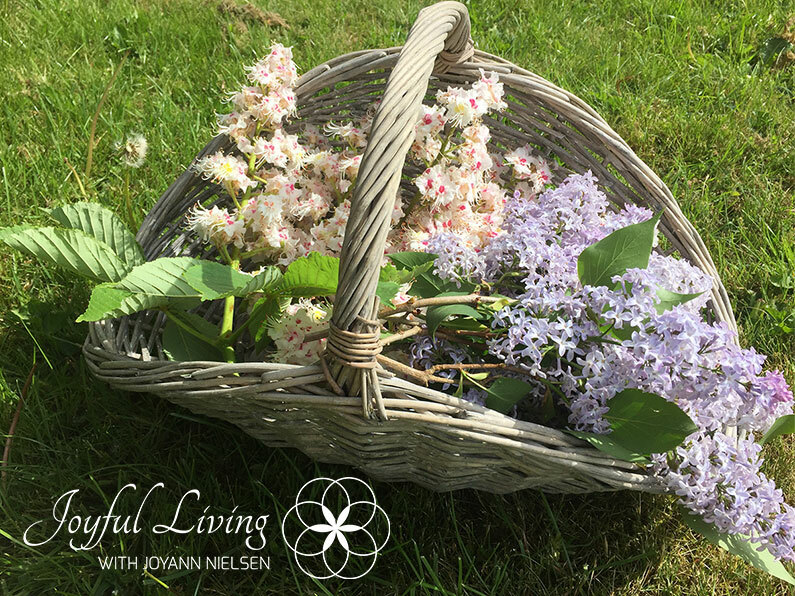 I cut what I was attracted to, keeping connected to my body and the earth, feeling into how many flowers I wanted to pick of each kind? What flowers called me? I enjoyed the tour in full, the fragrances, the sounds, the colors, the beauty. 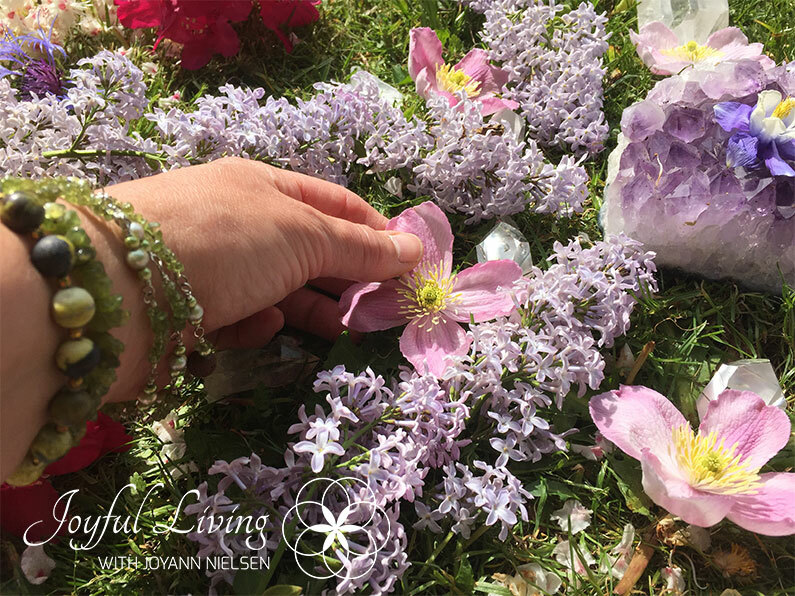 Where to place my Abundance Flower Mandala? I wanted the Mandala to be in the Feng Shui area of prosperity and abundance in the garden. It is the rear left area if you look at the property from the entrance / driveway, dividing it into 9 equal squares. 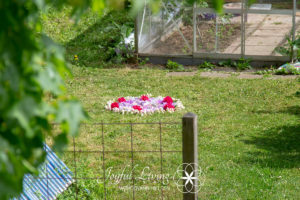 In my case it is a part of the garden where we have many tall trees, an older greenhouse and a bed of raspberries, asparagus, Jerusalem artichokes, potatoes and gooseberries. I found a good place just in front of the greenhouse for the Mandala. From here we can see it from the kitchen and I have full view of it from my creative space on the first floor. Ok, ready to lay my flowers out. Almost. I sat down for a moment, closed my eyes, turned the attention inward, downward, to Mother Earth, thanking for the gifts. A Mandala is a circle. I started by defining the perimeter with chestnut flowers, and the middle with a large Amethyst crystal. 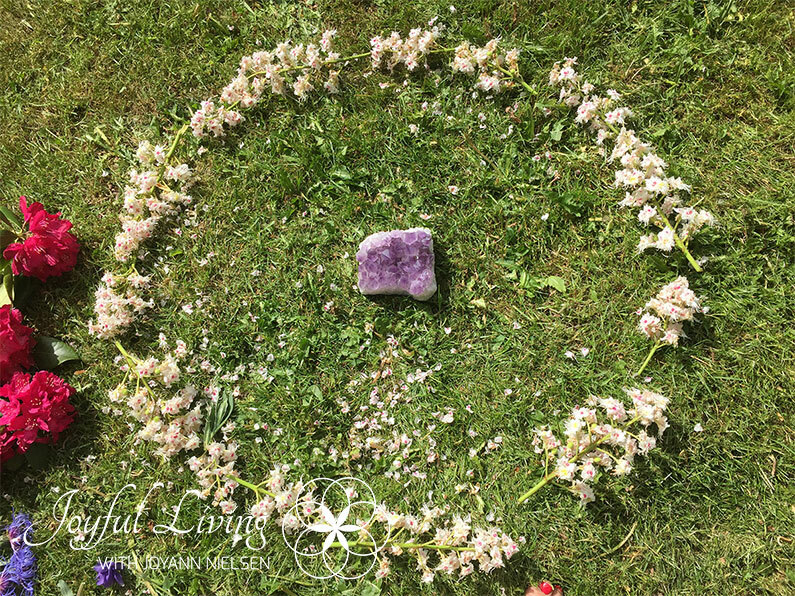 From there it was easy, just putting flowers and crystals into the circle and a pattern of harmony appeared, just laying it all out from the heart. I did not think about what would be where, just let my hands and the flow guide me. 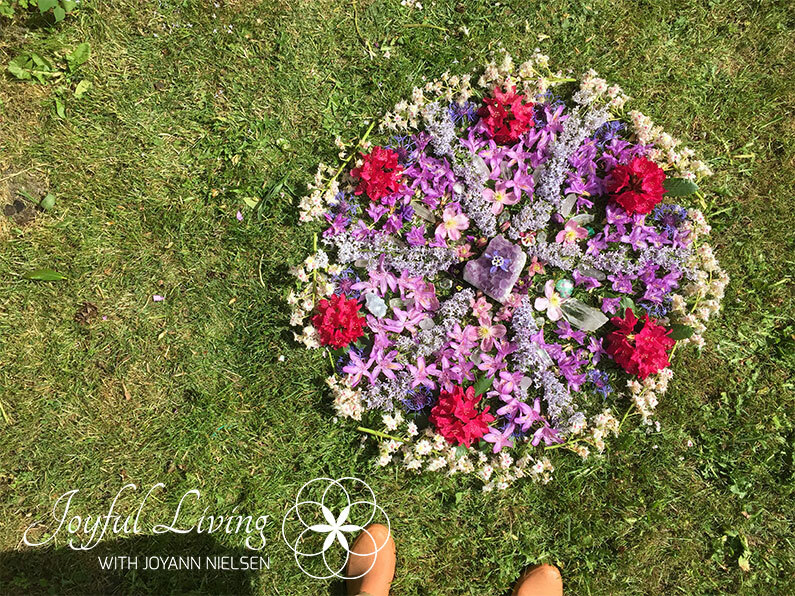 The Flower Mandala felt finished and I stopped, took a few steps back, looked and tuned in to my body feeling. I noticed that almost all the flowers were laid up, there were only a few left in my basket. They fit nicely in a vase in the dining room. Really beautiful, enriching process. I took a lot of pictures – because, you know, the artwork itself does not last long. Are you inspired to make your own Mandala? A Mandala can be just as you create it, there are no rules. Apart from the fact that most Mandalas has a circular shape. The purpose of a Flower Mandala ?? Gratitude, joy, creativity, contact to Mother Earth, get close to your inner child, honor your inner Goddess, create some beautiful, honor diversity, honor the beauty and simplicity of life.